Not long after the terrorist airliner attack on Tuesday, 11 September 2001, I said to myself, "Why, we've been blitzed!" As the week went on I found myself growing both sadder and angrier. What does this mean for our usual activities? It all certainly is disruptive to our thoughts, feelings, and many ordinary things; and it is likely to get worse before it gets better. I certainly sympathize with those who have not been in the mood lately for dance or other entertainment. It is awful to look at those pictures of the faces of the missing, whom we know are dead. My son and I put out a flag in front of our house. 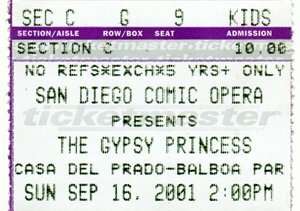 Today he and I attended a performance of an operetta with lots of waltzing, Emmerich Kalman's delightful The Gypsy Princess, put on by the San Diego Comic Opera. The director, J. Sherwood Montgomery, opened with a moving speech — saying that the Nazi blitz of London could not smash London into joylessness, nor drive its performers off their stages. Reviving a wartime tradition, the audience sang "The Star-Spangled Banner" — I don't remember ever before crying during that song. I know two musicians in the Gypsy Princess orchestra; and I am sure that it is not easy for the cast to come on stage to sing and dance for you. But they believe it is the right thing to do, and I agree. These musicians, cast, stage crew, and staff are doing more than enduring, they are helping to revive our joys. The Gypsy Princess first opened in 1915 in wartime Vienna, in dark times indeed. But such art is an essential component of our civilization, that we must not let the enemies of civilization suppress. Come to dance when you're ready; come to shows when you're ready. Those of us who (like myself) have worn the uniform of the United States always have been buoyed by remembering that we defend the vibrant America we love — not some joyless fortress of that name, but our living country. The Gypsy Princess has a great cast; not only is the operetta sung in English here, but the singers' diction is so clear, their elocution so excellent that they make it easy to follow not only the plot but the witty repartee. There is fine music, singing and waltzing. The show goes on; the cast would love to see you there. You will be glad you went.